Welcome back to our weekly bento lunch recipe series here at Southern Mom Cooks. Every week for the last four months we have been sharing a new and unique school lunch idea that is different from the normal peanut butter and jelly sandwich. These ideas are to help keep variety in your kids lunch box each day. Over the months we have shared ideas like our All Star Lunch, Pizza Lunchable, and even a few back to school lunch ideas. These lunch ideas can not only be used for your kids school lunch but if you work outside the home they could work for you too! Today we have a delicious Waffle Sandwich lunch idea that is full of my kids favorite ingredients! This is a great way to use up that last waffle from breakfast if you have left overs or just make a twist on the normal peanut butter and jelly sandwich! Enjoy! 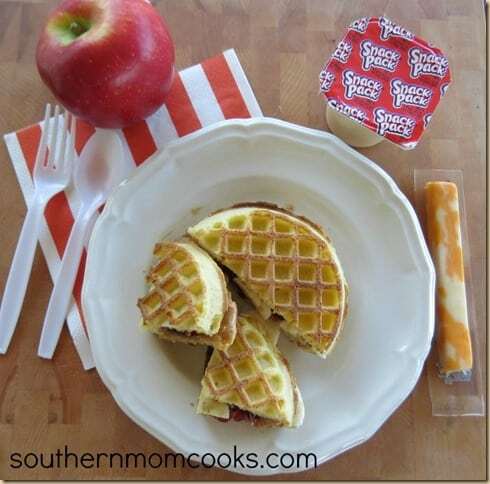 Making a Waffle Sandwich is simple and delicious here are the instructions! Step Three – Cut up a banana and add it to the waffle. Enjoy! The ingredients that you need for this sandwich are things that we always have on hand so that makes it a super easy lunch idea! My boys loved these sandwiches! 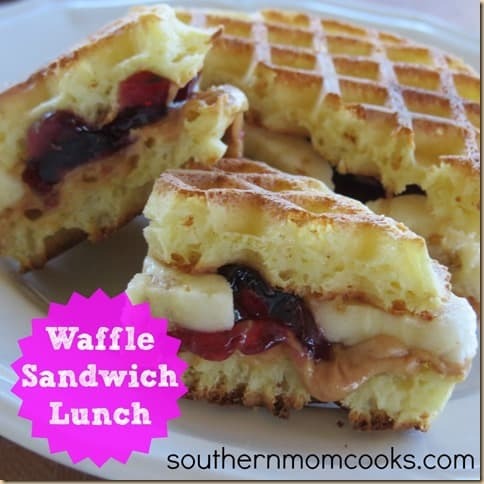 They thought they were not only delicious but fun to eat a waffle sandwich! You can find additional breakfast for lunch ideas listed below! What unique lunch ideas have you made for your kids lately? I’m a little exercise machine but food is my downfall. I shouldn’t.. . What kind of food do you keep around your house? What do you usually have for breakfast, lunch, and dinner? Do you have five meals a day instead?. Wow, I love peanut butter and waffles, this looks so yummy and so simple, thanks for posting! That looks delicious! I love waffles and have no idea why I never thought to make a sandwich out of them!